This turmeric milk with almond milk, turmeric, ginger, cinnamon, cardamom, and vanilla has a rich creamy texture and exquisite flavor. Enjoy hot or cold. 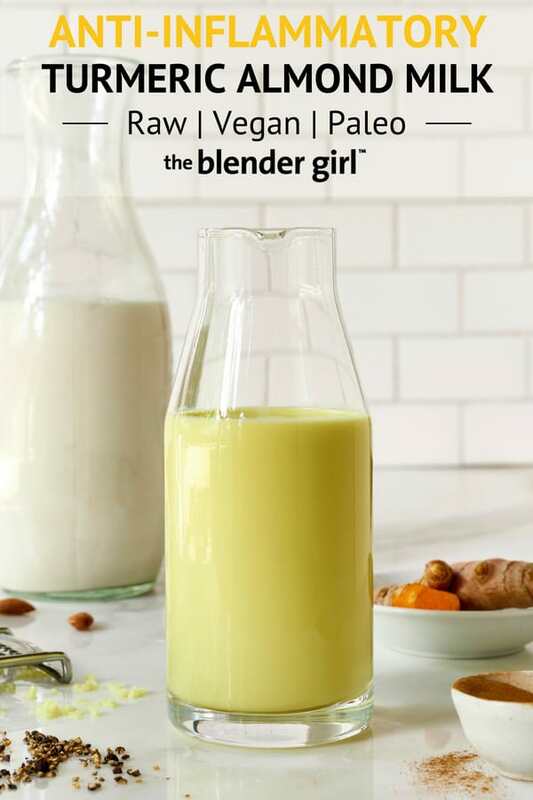 I’ve been making this turmeric milk recipe for years, and it is alway a hit, whether I serve it hot or cold. There is always a fresh batch in my fridge! I should have posted it on the site years ago. I apologize. There were so many turmeric milk recipes flooding the web, I didn’t think there was room for one more. Big mistake. There is always room for another seat at the table, and I think my turmeric milk recipe rocks! I love this golden milk recipe because it has perfectly balanced flavor with the base of almond milk with the turmeric, ginger, cinnamon, cardamom, and vanilla. I’ve shared a classic date-sweetened option, and a sugar-free option for those of you who are following Keto, Whole 30, Alkaline, Body Ecology, Alkaline, Diabetic, or Anti-Cancer diets, or if you want to reduce your sugar intake. Turmeric milk, also referred to as Turmeric Golden Milk or just Golden Milk has been trending heavily in the West for the last few years, and with good reason. It is pure medicinal magic. This ancient Indian drink in Ayurvedic culture, traditionally made with either cow’s milk, goat’s milk, or almond milk and containing turmeric, ginger, and cinnamon and sweetened with honey, cane sugar, or dates is made by either whisking the turmeric and other spices into the milk and heating on the stove, or by throwing everything into the blender. Turmeric milk was traditionally enjoyed as a medicinal tonic and anti-inflammatory agent to ease muscle aches and pains, aid sleep, boost immunity, flush out microbes to aid digestion, and clear respiratory congestion to combat cold and flu. Read more about the benefits of drinking turmeric milk below. Nowadays, golden milk is still enjoyed for the health benefits as well as the fabulous flavor with turmeric milk and golden milk lattes on offer at most high-end juice bars, health food stores, and restaurants. To make turmeric milk, you can either whisk the turmeric and other spices into the milk and warm in a saucepan on the stove top, or you can your use blender, which is what I do. 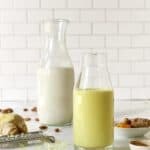 I’m making homemade almond milk and using fresh ginger instead of dried ginger in this recipe, so you do need to use a blender to make this golden milk recipe. Make your almond milk. 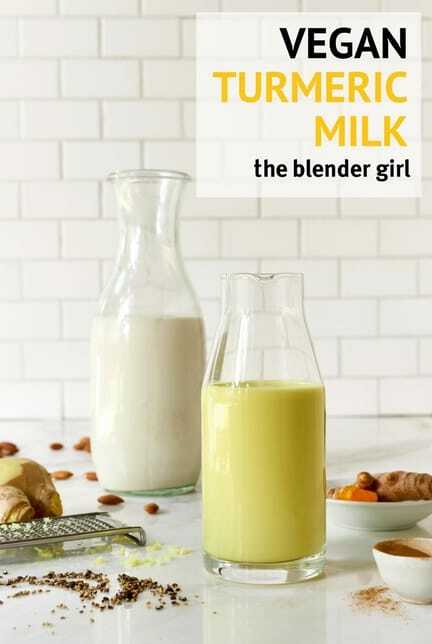 (You can use unsweetened commercial almond milk to make turmeric milk. But, the flavor, super creamy texture, and health benefits are so much better if you take the extra 5 minutes to make your own almond milk. Take 1 cup of almonds and 3 cups of water, and blast in your blender on high for about 60 seconds until the almonds are completely pulverized. Strain the milk, wash the blender container, and pour the strained milk back into the blender. Add the dates (or birch xylitol and stevia), turmeric, ginger, cinnamon, cardamom, vanilla, black pepper, salt, and blast for another 2o – 30 seconds, until smooth. To make a turmeric latte, you can heat it in your high-speed blender. Select the soup setting of your blender or blast on high for about 5 minutes until the mixture is piping hot. 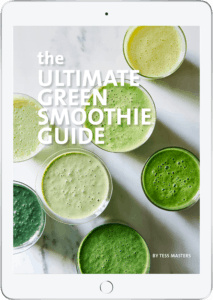 If you’re using a conventional blender, blast on high for 10 to 20 seconds until the mixture is smooth and creamy, and transfer to a small saucepan, and warm on medium-low heat for a few minutes until hot. I’ve used a generous amount of turmeric in this recipe. If it is too much for you to begin with, start with 1 teaspoon, and build up from there. Some people also add allspice and cloves to their turmeric milk. Experiment with that. But, I think those spices are bully spices, and even in small amounts, overpower the other elements. In addition to the star ingredient, turmeric, most turmeric milk recipes also contain ginger and cinnamon. So, the benefits below pertain to turmeric milks containing turmeric, ginger, and cinnamon like the recipe I’m sharing in this post. Here the Top 8 Health Benefits of Turmeric Milk. Antioxidant Ammo – which helps combat oxidative stress and abnormal cell growth, boost immunity, and aid overall health. Anti-Inflammatory Agents – to reduce joint pain and swelling, particularly that associated with osteoarthritis and rheumatoid arthritis. Anti-bacterial, Anti-viral and Anti-fungal Properties – to help fight infections, inhibit the growth of bacteria, and strengthen your immune system. Heart Healthy Agents – turmeric, ginger, and cinnamon can help improve endothelial function (blood vessel linings) and can help regulate blood pressure and cholesterol. Aids Digestion – feeds friendly bacteria for gut health, helps calm the gut lining, helps boost fat metabolism, and can calm symptoms of indigestion. Helps Lower Blood Sugar Levels – ginger and cinnamon help reduce insulin resistance and help balance blood sugar levels. Brain Function Booster – to aid healthy memory and cognitive function to combat the decline associated with Alzheimer’s and Parkinson’s disease. 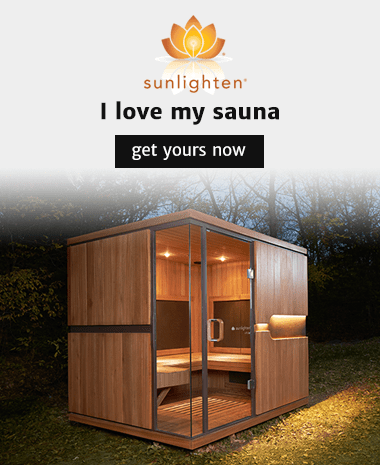 Mood Enhancer – to help combat the symptoms of anxiety and depression. 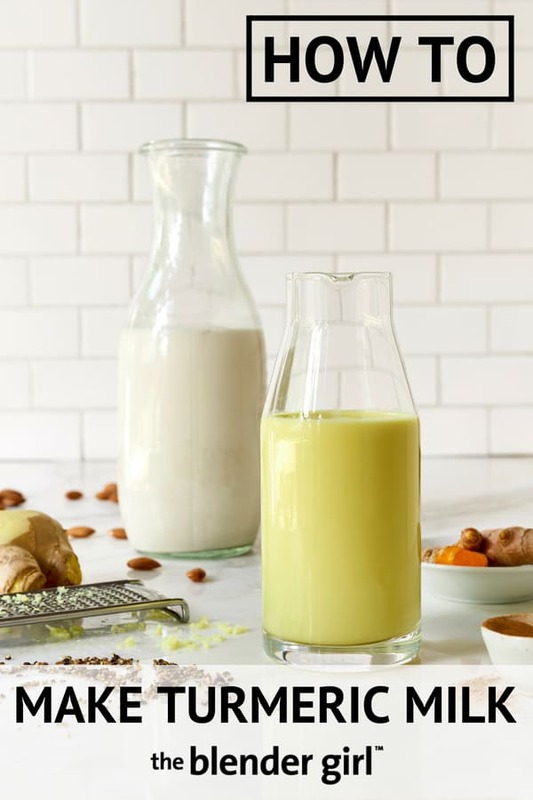 Don’t miss making this turmeric milk. It is really really delicious. Drain and rinse the soaked almonds. Discard the soaking liquid. Transfer the drained almonds into the blender and add the 3 cups of filtered water. Blast on high for 30 to 60 seconds until the almond are pulverized. Strain the almond milk with a nut milk bag, filtration bag, or sheer knee-high piece of hosiery. Wash your blender container and lid, and pour the strained milk into the container. Add the dates (or birch xylitol and stevia), turmeric, ginger, vanilla, cinnamon, cardamom, black pepper, and salt, and blast on high for 10 to 20 seconds until the mixture is smooth and creamy. Transfer to a sealed glass jar, chill in the fridge, and consume chilled. Or gently warm on the stove top on low heat. The milk will keep in the fridge for 2 to 3 days. *Soak almonds for 8 hours. See Instructions. **For sugar-free, substitute 1 1/2 tablespoons powdered birch xylitol + 1/4 teaspoon alcohol-free liquid stevia for the dates to make this anti-inflammatory, alkaline, unsweetened, and suitable for diabetics and cancer patients.